Several UK holiday operators have cancelled their flights to Mexico due to the outbreak of the swine flu virus that could have claimed 152 lives. Thomson and First Choice, both owned by TUI Travel, say they have cancelled planned flights to Cancun from Manchester and Gatwick airports. They said they planned to start flying customers in Mexico back to the UK. 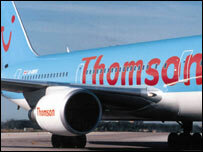 Rival Thomas Cook also said it has cancelled all flights to Cancun for the next seven days. Thomas Cook, Thomson and First Choice said their decision followed the UK Foreign Office's decision to advise only essential travel to Mexico. "Whilst we do appreciate that this news may be a great disappointment to customers, we hope they will also understand that their health and safety is of paramount importance to Thomson and First Choice" the firms said. British Airways said it will not cancel any of its four weekly flights to Mexico, leaving it up to travellers to decide if their travel is essential. Customers have the option to make a free amendment to their booking, or to cancel their holiday and receive a full refund without incurring any cancellation charge, Thomson and First Choice said. Thomson and First Choice said they were cancelling all flights to Mexico until 8 May, and giving customers going to Mexico between 9 and 22 May the option of amending their holiday plans to travel on a different date or to a different destination. Those who were scheduled to travel to Mexico up to 8 May would also be able to claim a full refund without incurring any cancellation charge. Frank Shepherd, of government-funded advice line Consumer Direct, said that travel insurance companies and tour operators should take guidance from official travel advice given out by the Foreign and Commonwealth Office. Travel insurance providers are likely to pay out if a holiday is cancelled after the official advice has been not to go to affected countries. Tour operators and credit card companies should also consider this official advice when dealing with claims. Holidaymakers who spent more than £100 on travel on their credit card can make a claim to their credit card provider. Mr Shepherd urged people to look at the terms and conditions in their policies and travel documents as claims were likely to be dealt with on a case-by-case basis. Did UK get it right? Can masks help stop flu spread? What happened to the swine flu pandemic? Has China's housing bubble burst? Copyright © 2019 BBC. The BBC is not responsible for the content of external sites. Read more. This page is best viewed in an up-to-date web browser with style sheets (CSS) enabled. While you will be able to view the content of this page in your current browser, you will not be able to get the full visual experience. Please consider upgrading your browser software or enabling style sheets (CSS) if you are able to do so.